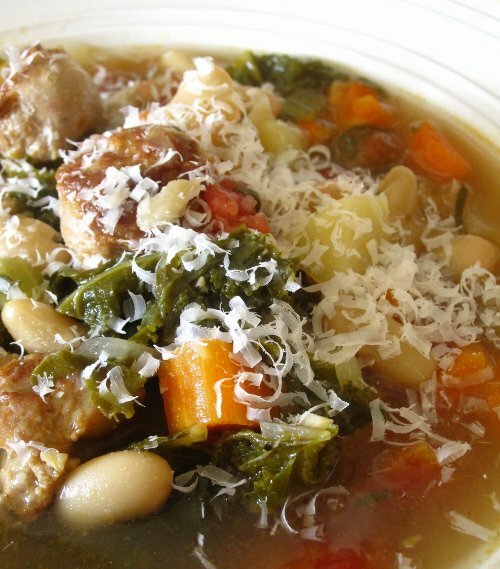 Surprisingly bright for a bean-ish dish, this Tuscan soup has plenty of flavor to complement the meatier textures of the beans and potatoes. Warm arugula adds a little extra zing and a fancy, restaurant-style flair without getting things too insanely weird. Pair with garlic bread and a salad that’s less the “sweet, heavy” type and more the sort that has pine nuts and/or olives in it. Note: The photo above is someone else’s soup; this recipe below (from Moosewood’s Simple Suppers) doesn’t include sausage, carrots, or white beans, but otherwise looks pretty similar. If you want, you can throw in some sausage, chopped: I like MorningStar’s vegetarian breakfast sausage links or Yves’ vegetarian Italian sausage (the Yves item is also an EXCELLENT vegetarian hot dog.). 1 sprig fresh rosemary (about 4 in long – or 1-2 Tbsp dried); either include whole sprig, or remove and break/rub/crush/mince the leaves. Discard stalk. 1. Put oil, onions, and garlic in bottom of soup pot and sauté until garlic is fragrant but not burnt, about 2 min. Add potatoes, rosemary, broth, and salt; cover, and bring to a boil. Add the beans and the wine (or lemon juice), then reduce heat and simmer, covered, until the potatoes are tender, about 10 minutes. 2. While the potatoes cook, rinse and drain the arugula. Remove any large or tough stems, and coarsely chop any large leaves. Set aside. 3. When the potatoes are tender, add the basil. Salt & pepper to taste. Remove and discard the rosemary sprig – some leaves may stay behind in the soup, and that’s fine. Put a handful of arugula into each bowl and ladle the hot soup over it. Serve immediately with lemon wedges and/or cheese.